Taiwan-based Forest Water Environmental Engineering (Eng’g) Co. Ltd. reported that its combined revenue for this February totaled TWD 298 million, a drop of 9.7% from the same month of the prior year and a drop of 31.87% from this January. However, the cumulative revenue for the January-February period reached TWD 737 million, an increase of 7.2% from the same two-month period of the prior year. The company stated that the revenue decline in February was mainly attributed to the Lunar New holidays that reduced the work days for the month. The recent outbreaks of African swine fever around the world has led to a review and tightening of regulations related to the disposal of kitchen wastes in Taiwan. According to the data from Taiwan’s Environmental Protection Administration, the whole island produces about 650,000 metric tons of kitchen wastes annually. The majority of that amount is sent to local pig farms to be used as feed, while much of the rest is transformed into fertilizer via the composting process. Taiwan’s government in recent years has begun promoting the processing food and kitchen wastes into biofuels that can be used for electricity generation. The push for this scheme now has more momentum as the local authorities in cities, towns, and counties have either imposed a ban on using kitchen wastes as pig feed or are actively discouraging the practice. Finding ways to get rid of tons of kitchen wastes that are piling up across the island has become a pressing issue. Forest Water Environmental Egn’g in its earnings report for February also raised the topic of kitchen wastes. The company stated that foreign engineering firms began developing technologies for the biomass conversion of kitchen and food wastes 20 to 30 years ago. With the related technologies now reaching maturity, the company believes that biomass conversion represents the best solution for dealing with the issue of kitchen wastes on the island. 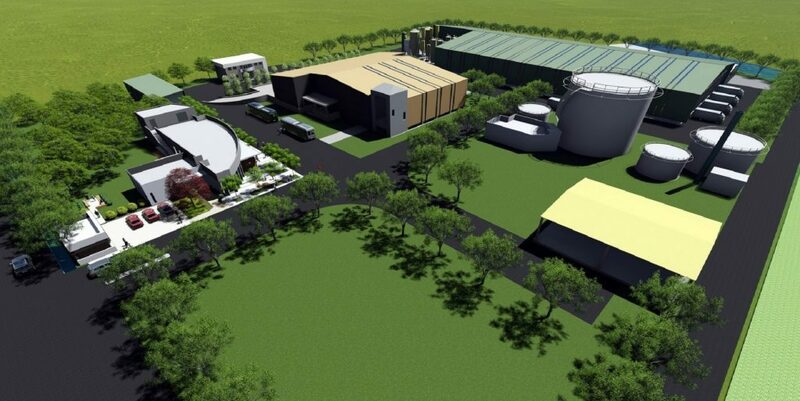 A subsidiary of Forest Water Environmental Eng’g has built two process lines that turns organic wastes into biofuel in Waipu Green Energy Ecological Park located in Taichung City. One line converts kitchen wastes into biofuel via an anaerobic digestion process, while the other line do the same thing to hay via a gasification process. The biofuel in turn is fed into a generation system. The entire project, which is now in the trial operation stage, is producing and selling electricity. When the project enters the formal operation stage in the near future, it is expected to process around 54,000 metric of kitchen wastes and more than 50,000 metric tons of hay annually. The annual power output of the project is estimated at 33.77 million kWh, which would be enough to satisfy the annual demand of nearly 10,000 households. In support of the government’s Diversified Garbage Disposal Plan, Forest Water Environmental Eng’g also intends to develop technologies for processing cooked kitchen wastes. On the whole, biomass conversion of kitchen wastes will help maximize resource utilization efficiency and create new opportunities under the government’s Circular Economy framework. At present, Taiwan’s massive economic development plan – the Forward-Looking Infrastructure Development Program – contains investments in bioenergy (under the green energy section of the program). Local governments are also looking for solutions to reduce and reuse kitchen wastes. Thus, Forest Water Environmental Eng’g believes that it has a strong chance to replicate the success in Waipu Green Energy Ecological Park, thereby further expanding its operations and setting a standard in its industry. Forest Water Environmental in its earnings report also emphasized that it is venturing into multiple business areas and regional markets. Besides serving its home market Taiwan, the international environmental engineering firm is active in China and Southeast Asia. Regarding Southeast Asia, the government’s New Southbound Initiative is expected to help grow the company’s presence there. The company’s portfolio covers a wide range of services and technological solutions. Some of the fields that Forest Water Environmental Eng’g is involved in include hydraulic engineering, soil contamination, restaurant waste management, the reuse of incinerator bottom ash, etc. The company has also invested in the building of water treatment facilities that can offer stable, long-term income. One of the company’s major objectives is to establish a recurring revenue platform that can support operational growth in the future.